If you are training to swim competitively, longer swims may require you to fuel during your session. If you're a recreational swimmer it's unlikely you'll have to worry about eating during a swim, though you might want to consider hydration as explained below. As it's difficult to eat during swimming, the focus should be on fuelling before training to maintain energy. For endurance training (over an hour) or high-intensity sessions, taking on small amounts of carbohydrates may help to maintain energy and performance. The focus of these should be around carbohydrate-electrolyte sports drinks (or gels), which are rapidly absorbed in the gut. As the response is very individual, this is a strategy that requires practice. Staying hydrated is an important consideration in swimming as often temperatures in the pool and ‘on deck’ are warm and humid. Sweat losses (and overall hydration status) are more difficult to determine, as swimmers are already wet from the pool. 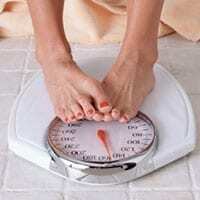 A greater than 2% loss of body mass (e.g. 1kg for a 50kg athlete) can negatively affect performance and concentration, with this strain on the body making training feel harder. 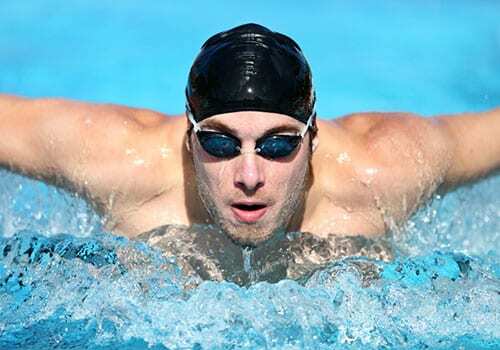 Regular swimmers should try to estimate sweat rates. This is easily done by weighing themselves (in minimal clothing) before and after a swim (following towelling down), then subtracting any fluid consumed. Every 1 kg lost = 1 litre in sweat (e.g. 1 litre lost from a 120 minute swim). For every 1kg lost: 1.5litres fluid need to be replaced (to allow for continued losses post session). A basic rehydration strategy can then be formed after training to replace fluid losses. 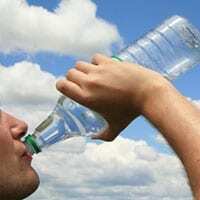 Alongside this, during any exercise you should listen to your body, and drink according to thirst. The body’s physiology is tightly regulated so that when there is excess sweat loss (affecting blood levels) the thirst mechanism is triggered. Both of these measures can help exercisers develop an appropriate strategy to stay hydrated, as one size doesn’t fit all. How often should I drink during my swim? To ensure you begin a training session well hydrated - drink 500ml of water two hours before getting in the pool. This will allow any excess to be passed as urine. Then, if tolerable, small sips over the course of the session will help keep levels topped up. Remember - A small amount of dehydration isn’t a problem, the body tolerates this well. Rehydrating during your swim may only be necessary during particularly long or heavy training sessions. What are electrolytes and where can I get them? 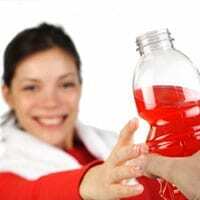 Electrolytes are found in the blood, sweat and other fluids and have an important role in maintaining fluid balance within the body. Sodium is the most important electrolyte for hydration while others include potassium and chloride. Sodium levels in the blood are tightly controlled. Fluid and electrolytes are lost in sweat and therefore need to be replaced. Sodium allows the body to absorb and retain more fluid, thus maintaining hydration. Drinking large volumes of water alone can just pass straight though the intestines and be lost as urine. Sodium is found in food, so breakfast will help with electrolyte balance during exercise. Sodium is also found in sports drinks and gels, which are an easy way to absorb and retain fluid during the training. Can I continue to drink caffeine and alcohol in moderation during my training? It’s better to cut out (or cut down) alcohol around heavy training sessions, as this can interfere with the body’s maintenance of blood glucose and recovery (including sleep quality) after training. If you are going to enjoy the odd tipple, ensure it is after you have finished your recovery following your training. Caffeine has previously been criticised within sport and exercise nutrition, but recent research has shown that it can be positive for performance. For example, if you are a habitual tea or coffee drinker, these drinks will contribute to your daily fluid intake (not just water) and in smaller doses don’t dehydrate you, as we have been previously led to believe. 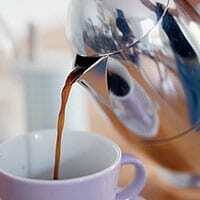 Caffeine is also often used by elite swimmers due to its ability to stimulate the brain and make training feel easier. Are you training for an event this year? Share your tips and experiences below. As a sport and exercise nutritionist, James Collins regularly provides comment and consultation within the media and maintains a role of governance within health & nutrition in the UK, where he sits on The Royal Society of Medicine's (RSM) 'Food and Health' Council. He was heavily involved in advising Team GB in the run up to the London 2012 Olympic games, and now towards Rio 2016.